Compensation: None, except expenses for travel, lodging, and meals, if necessary. 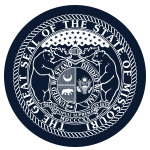 Member Requirements: No elected official of the state of Missouri or of any city or county in the state shall be appointed to the commission. Political Requirements: No more than three shall belong to the same political party. Geographic Requirements: Governor appointees can not reside in Cole County.